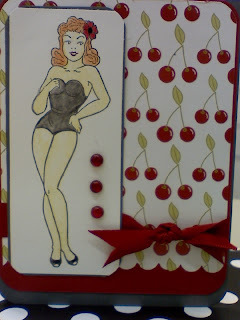 I had to play last night with my stamps... not any stamps, but my Bombshell stamps. Why? You may ask...well, I have a few milestone birthdays arriving shortly, and one for my sweetie, and these stamps would be perfect for them, so I need to make them and get that comfort zone. I paired it with the Rockabilly Papers by SU! and in my embellishment stash I found these dew drops that I received as a gift (so be prepared to see more of these- now that I remember where I put them) and added them as well. What is not visible is the 3D I put on her outfit, wanted a leather look, but I didn't quite make it. I will keep practicing. Here is a shot of all three of my gals I did last night. 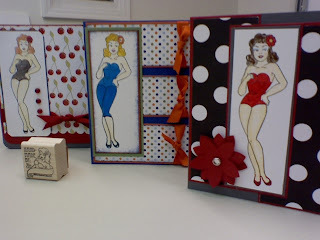 Of course my favorite is the polka dots sassy one. I will work more with that paper as time goes by. Last but not least, isn't she adorable? 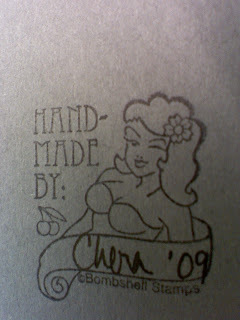 To go with my Bombshell stamps, I got this "handmade by" - for the complete look. Have a BOMBSHELL of a day! are the bombshell stamps from SU?